showing the true nature of our world. For a long time I have been intrigued by the concept of the Hollow Earth. I remember reading Raymond Bernard's book on the subject ( The Hollow Earth - 1979 ) in the mid 1980's and felt a strong affinity for the whole idea. Next, I read a strange book called "Etidorhpa" by John Uri Llyod written in the late 1890's about a person who traveled from the Outer Surface to the Inner Surface of the Earth and carrying when he arrived at the center of the Earth crust. But before I lose our readers, let me define what the Hollow Earth Theory states! According to Mr. Bernard (see diagram above) our world is hollow, with the crust of the earth being 800 miles thick. There exists two openings at the North and South Pole, each hole having a circumference of 1400 miles wide. At the center of the earth is not a molten core but an inner sun which is six hundred miles wide and is 2900 miles from the Inner Surfaces. The diameter of the lip at the opening at the poles is 1200 miles long, thus a person can not see the other side of the opening. Therefore, there exists three worlds on our planet, the outer surface, where we live, the middle earth which purportedly is lined with many caverns, tunnels (made by someone), Inner Cities and people who live there and lastly the Inner Surface. How Gravity works then is the following. For the people who live on the outer surface, Gravity holds them down. For the people that live in the middle earth, the closer they get to the center of the crust (i.e. - 400 miles down), the less effect gravity will have upon them. In the book, "Etidorhpa", when this individual traveling down into the earth reached the center of gravity, i.e. where there is no gravity --- he was able to move by the power of his mind, his heart stop beating and he didn't need to eat. He described gigantic vegetation that lives under the earth as this lesser pull of gravity allows things to grow larger. Lastly for the people who live on the inner surface, they would also feel gravity pull on them to walk on this surface but since there is an inner sun (called the "Atoma", by channeler Michael Kant who appears in our crystal skull book Mysteries of the Crystal Skulls Revealed) they would have sunlight 24 hours a day. There is supposedly land masses and water bodies that exist on the Inner Earth, the same as the outer surface except the vibration and energy in the Inner Earth is more pure and of a higher vibrational frequency (some say a 4th dimensional frequency). For people who have claimed to travel to the Inner Earth, they state that the people they encounter in this region are usually very tall. Some other individuals have speculated that descendants of Atlantis and Lemuria live in this Inner Utopia and therefore they are thousands of years ahead of us technologically and spiritually. Some others say that possibly the Mayans may have gone into this location as well, to explain where they disappeared. Again, according to our channeler Michael Kant, he claims that 12 galactic races came to our Earth long ago and created their first city underground in the 4 Corners area. 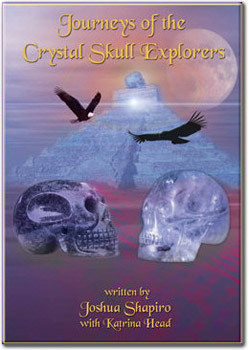 Each race brought with them a crystal skull and body which contained the gentic coding of their race and cosmic knowledge. Six tribes decided to stay on the surface of the Earth and Six tribes went into the Inner Earth. Now all twelve tribe exist in the Inner Earth. It is also believed that other Extraterrestrial races may have bases in the Inner Earth as well. Michael describes in our book being taken by a Pleiadian Space Ship and given a tour of the Inner Earth. In 1982, while traveling on faith throughout the western part of the U.S., I had the fortune to meet Ed Palmer in Portland, Oregon, who is the founder of the Cosmic Science Research Center. Ed told us a very strange tale about how he was an exchange baby, that he was originally from Orion but when he was very small, the true Ed Palmer was exchanged for him. He claimed that when he has had a physical examination that there are some differences in his body and also that he has some type of mental plate in his head in which if a UFO comes close, he hears a buzzing sound. Even though Ed was in his 70's or 80's, he definitely had more energy and excitement of life than I at this time (being 27). In any case, Ed gave us a pamphlet that he shared with others about the Hollow Earth. In this pamphlet it said that all planets are Hollow (in Bernard's book, Mr. Bernard explains that what appears to be the pole cap we see of Mars, is actually the light of Mar's inner sun shining out of the pole. Furthermore Bernard states that the Aurora Borealis that is only visible up north is the reflection of the inner sun off clouds passing over the opening of the pole. Also that some explorers of the North Pole have discovered the closer they get to the Pole, the warmer it gets instead of the colder. Could the Mammoths discovered frozen in Siberia with fresh food in their mouth be actually Mammoths that live in the Inner Earth which has a warmer climate, and somehow got lost and wondered into the outer surface?) and that Ed even had a ride on a UFO to the moon which is hollow and that the ETs use the moon to construct spacecraft inside, hidden from our prying eyes. Ed explains that when a planet is formed it is first just gas which is rotating. He said that the heavy particles eventually expand out and create the planet's surface and the lighter particles contract to form the central sun. Another connection with the Inner Earth relates to Admiral Byrd. It is purported that when the Admiral went to explore the North Pole that he actually entered into the Inner Earth at the opening at this pole. Included below, you will see a purported diary by Admiral Byrd that discusses he made contact with an advanced people in this area who showed him their world and asked for him to take a message back to the surface dwellers and government of their concern about a future vision they had of our destroying our world and since this is their home as well, they of course wanted to prevent this. If such a people do exist, it is theorized that possibly some of the UFOs we see are not extraterrestrial but intraterrestials, as our elder brothers keep an eye on us. It would require a spacecraft that can negate the force of gravity to fly out ouf the Polar Openings as gravity would pull any boat or airplane to follow the outer-to-inner surface. Another spiritual channel we have been in communication with is Christine Hayes of the Star of Isis Foundation in San Antonio, Texas. She claims to be receiving telepathic information from the people who live in the Inner Earth. The Hollow Earth represents another important factor for us to consider as we unravel the mysteries surrounding the transformation of our world and the UFOs. If indeed there are other people who live in the middle earth and Inner Surface, then it is time for all life to unite once again on our world. If as Admiral Byrd states is correct and the Inner Earth people are more evolved then ourselves, then there is a great deal they can teach us as we attempt to create paradise on the outer surface. Could it be that within our grasp is the recorded history of our world and great universal knowledge being preserve by our Elder Brothers. I believe in the near future mankind will have proof of the existence of these other worlds which share our Mother Earth and that we will have more direct contact with these people.